First, there is the well-known Saffir-Simpson Wind Scale. 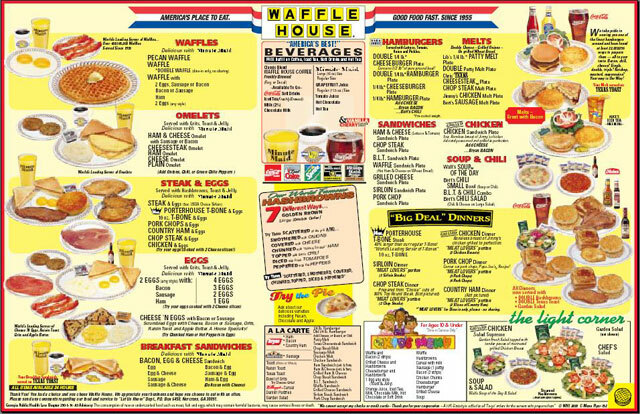 Then there is what he calls the "Waffle House Index." Green means the restaurant is serving a full menu, a signal that damage in an area is limited and the lights are on. Yellow means a limited menu, indicating power from a generator, at best, and low food supplies. Red means the restaurant is closed, a sign of severe damage in the area or unsafe conditions. "If you get there and the Waffle House is closed?" FEMA Administrator Craig Fugate has said. "That's really bad. That's where you go to work." Waffle House Inc. has 1,600 restaurants stretching from the mid-Atlantic to Florida and across the Gulf Coast, leaving it particularly vulnerable to hurricanes. Other businesses, of course, strive to reopen as quickly as possible after disasters. But the Waffle House, which spends almost nothing on advertising, has built a marketing strategy around the goodwill gained from being open when customers are most desperate. 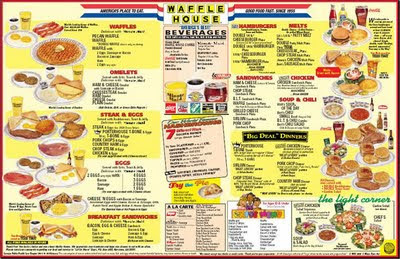 During Hurricane Irene, Waffle House lost power to 22 restaurants in North Carolina, Virginia, Maryland and Delaware. By Wednesday evening, all but one in hard-hit coastal Virginia were back in business. Hurricane Irene knocked out power in Weldon, N.C., on Saturday evening, but as the sun rose on this tobacco-farming town at 6:30 the next morning, the local Waffle House, still without electricity, was cooking up scrambled eggs and sausage biscuits. "I hadn't had a hot meal in two days, and I knew they'd be open," said Nicole Gainey, a 22-year-old secretary for a truck-repair company who drove over for breakfast. Waffle House, a privately held company based in suburban Atlanta, may be best known as a roadside stop for retirees driving south or the place where musician Kid Rock got into a brawl after a 2007 concert. Its yellow-and-black sign hasn't changed in 40 years, and its laminated menu with color photos is an intentional throwback to the heyday of the highway diner. Comedian Jim Gaffigan jokes the Waffle House "makes the IHOP seem international." The company fully embraced its post-disaster business strategy after Hurricane Katrina in 2005. Seven of its restaurants were destroyed and 100 more shut down, but those that reopened quickly were swamped with customers. The company decided to beef up its crisis-management processes. Senior executives developed a manual for opening after a disaster, bulked up on portable generators, bought a mobile command center and gave employees key fobs with emergency contacts. In a recent academic paper, Panos Kouvelis, a business-school professor at Washington University in St. Louis, pegged Waffle House as one of the top four companies for disaster response, with Wal-Mart Stores Inc., Home Depot Inc. and Lowe's Cos.